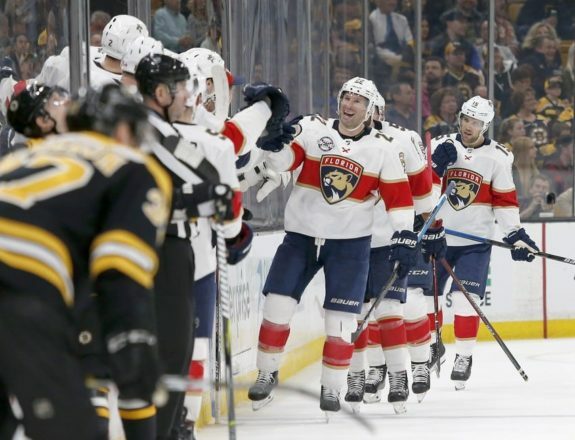 BOSTON — Troy Brouwer scored a short-handed goal and Roberto Luongo stopped 30 shots to help the Florida Panthers beat Boston 4-1 on Saturday and hand the Bruins their first loss at home since January. Noel Acciari scored and Tuukka Rask made 19 saves for Boston, which has already clinched a playoff berth and will most likely open the post-season at home against the Toronto Maple Leafs. The Panthers, who have already been eliminated from playoff contention, have won two straight to snap a four-game losing streak. But just 1:07 later, with the Bruins on their first power play of the game, Brouwer was the first one to reach a puck that caromed out to centre ice. He skated into the zone, faked a slap shot and then beat Rask with a wrister on the stick side to give the Panthers a 3-1 lead. NOTES: Boston’s 12-game home win streak was its longest since 2008-09. … Bruins F Chris Wagner won the team’s 7th Player Award, selected by a fan vote, for exceeding the expectations of Bruins fans during the season. Wagner, who signed as a free agent last summer, has a career-high 12 goals and six assists. He leads the Bruins and is ninth in the NHL with 245 hits. … Florida will play its last three games of the season at home. … Bruins F Brad Marchand was so upset at a play in the second period he slammed his stick against the boards as he returned to the bench, sending the blade flying back toward centre ice.